Whether you live in a six-bedroom mansion or a studio apartment, chances are you’ve had or will have an overnight guest at some point. And whether you are putting up your in-laws for a holiday weekend or letting your friend crash for the night, you want your guest to feel comfortable. How do you create overnight comfort for a guest? Where do you put the guest? While you could just throw a blanket onto the nearest couch that already contains decorative pillows, you could also plan ahead with the necessary equipment. 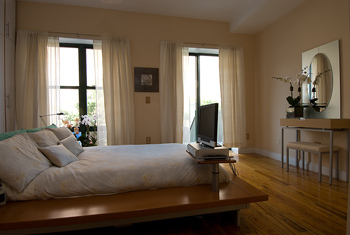 •	If you do happen to have a spare room available in your house, consider turning this room into a guest room. The ideal guest room would contain neutral décor in color schemes suitable for a man or woman, such as earthy tones in light green and brown. The sheets and bedspread should have a simple design and should be noticeably washed after every use. The closet should be empty so your guest can use it, and towels should be folded up on a chair. For an extra flare, you can place a mint on the pillow. A guest room offers your guest adequate privacy. Work with the space you have. If you have a private office, media room or any other room that is shared and belongs to no particular family member, add a pullout couch to this room. That way, when a guest comes to stay, the room can be offered to the guest as a private, enclosed area for him or her to rest. Even if you don’t have an entire room to offer a guest, work with accessories to create a peaceful atmosphere. In your main living area, include a pullout couch, a futon, a plush lounger or a sofa bed that will allow your guest to stretch out and sleep comfortably. On the nearest table, provide an alarm clock, a scented candle and an empty drawer for your guest to use. Consider purchasing a room divider that will provide extra privacy while you guest sleeps. Can’t fit any of the above furniture into your living quarters? Include a rollaway cot, a blowup mattress or a sleeping bag in one of your closets or storage areas. This way, at least you’ll have some sort of sleeping arrangement to offer your guest. Always keep a clean set of sheets, blankets and pillows in your house, and keep your floors vacuumed and your carpeting washed. Set up a sleeping arrangement for your guest that is located near a bathroom with a nightlight. Not only will these preparations organize you for when a guest does decide to stay, but neutral guest rooms, extra office furniture and plush couches also add to the appeal of your house on a regular basis.